I am enjoying every stitch of this shawl. Technically the name of the pattern is Aether, but In my head, as I knit, I’m calling it golden garter. Alliteration improves everything, right? The yarn changes color with the time of day and the changing lighting. 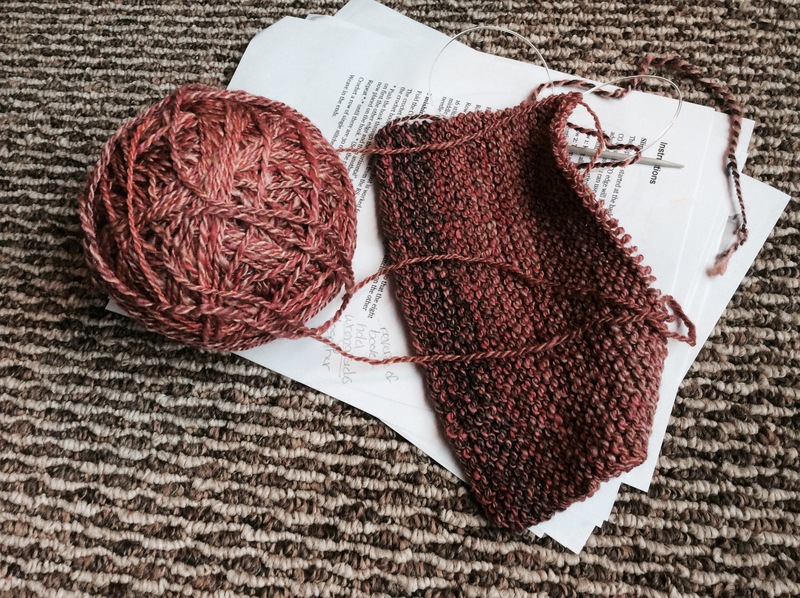 The yarn is Tosh merino light, in the colorway Nutmeg. In the morning sun it was bright and gold. Tonight by lamp light it is dark honey. Five of seven repeats are done, as is the first skein. 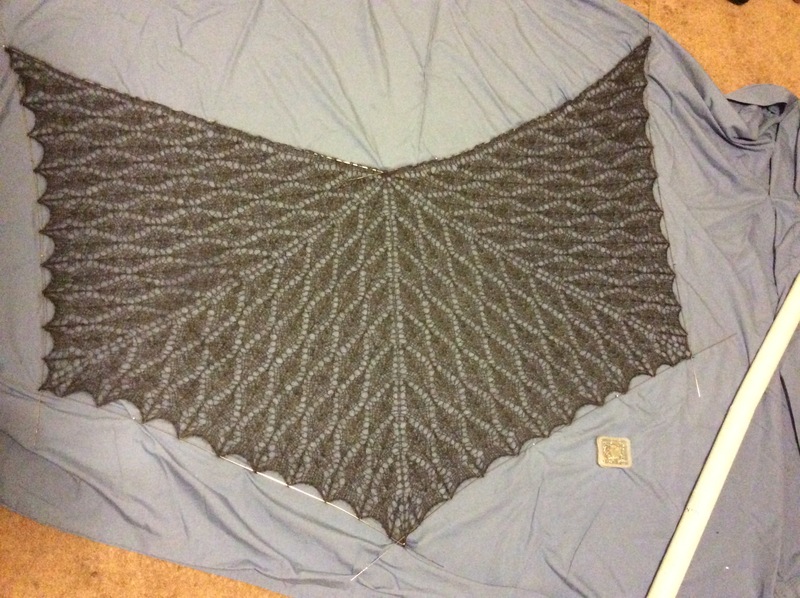 It has become clear that this is going to be a really big shawl when it is blocked! 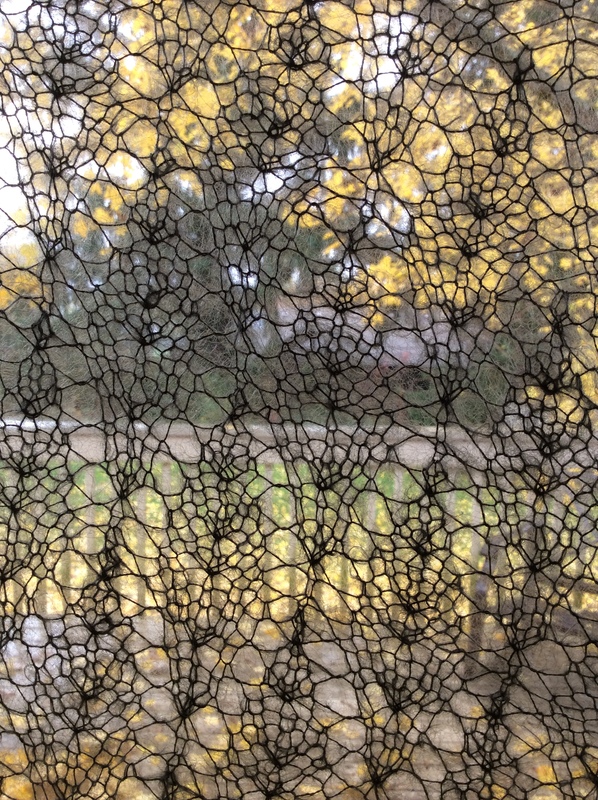 Blocking lace knitting creates such a dramatic change. A small pile of fuzziness, with the addition of some water and wires, becomes such a beautiful airy swath of loveliness. 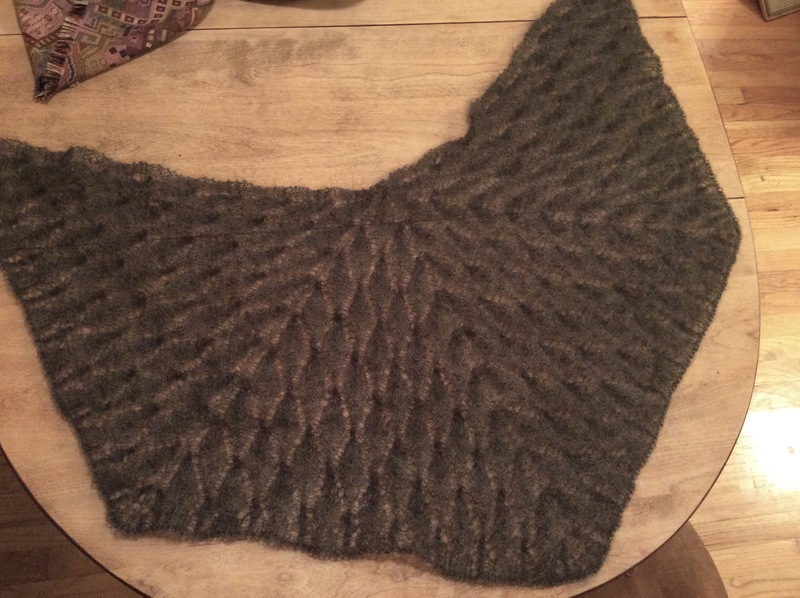 The pattern is Nypon, and the yarn is two skeins of charcoal gray Kid-Seta Melange – 70% mohair and 30% silk. Posted on November 15, 2015 November 15, 2015 Categories KnittingTags lace, Mohair, Shawl, Silk2 Comments on Such a difference! This weekend was a long planned crafting weekend at the cabin. A lot didn’t go as planned. My husband’s new job erupted with emergencies, meaning he had to work late on Friday and on Saturday. Luckily, Grandma stepped in to kid watch. Then my sister got sick and couldn’t drive up on Friday with me. Sort of creepy to arrive after dark at the cabin lot – no street lights there! One of the two friends who was arriving Saturday also got sick, so our retreat of four became a retreat of two. 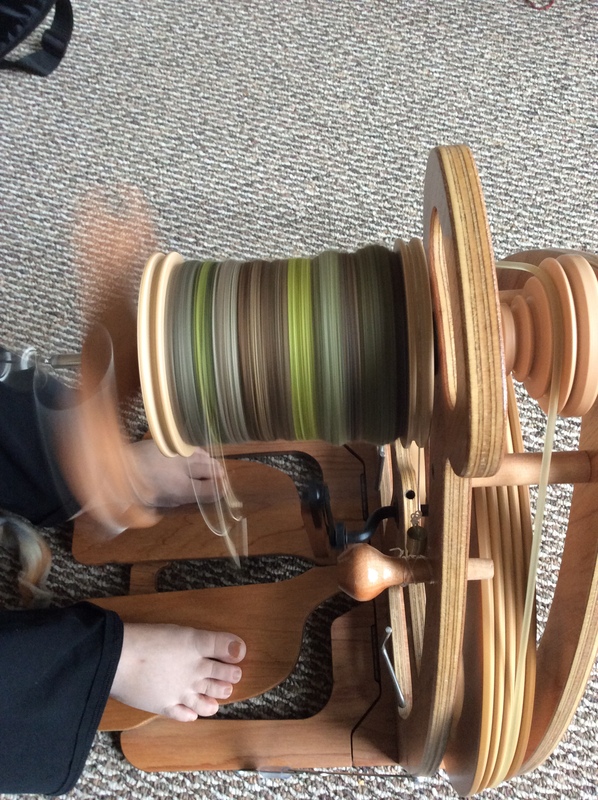 There was a lot of spinning, Paige on her Ashford Joy, me on my Kromski Sonata wheel. 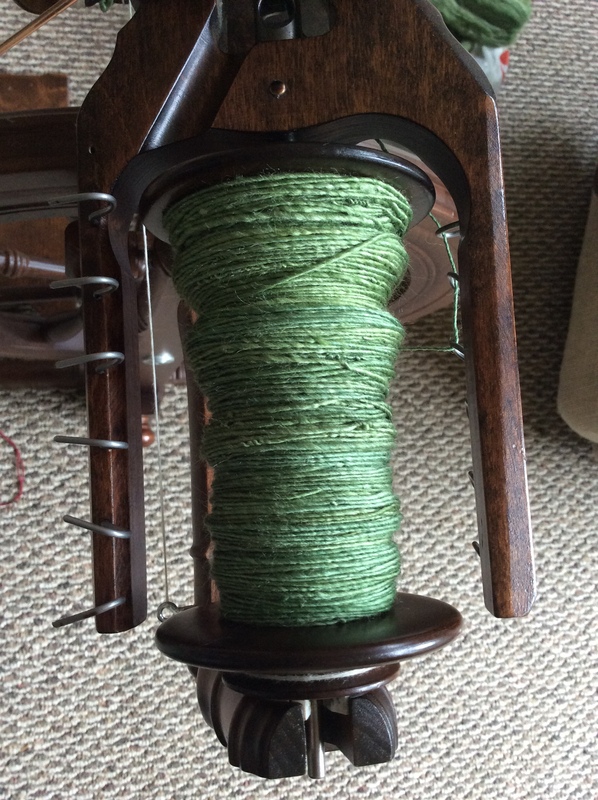 I finished the last of a green and blue merino I’ve been spinning occasionally. 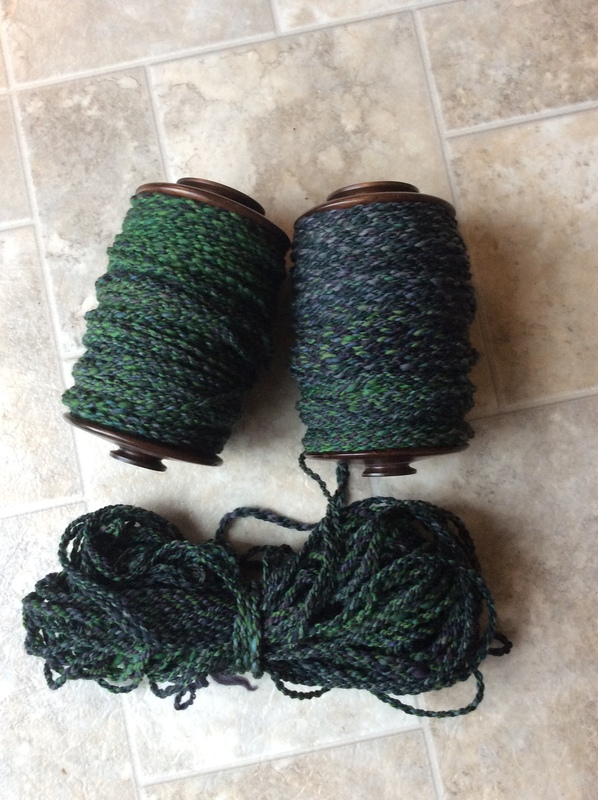 I’m trying to relearn spinning thicker singles after years of spinning thinner and thinner yarns. 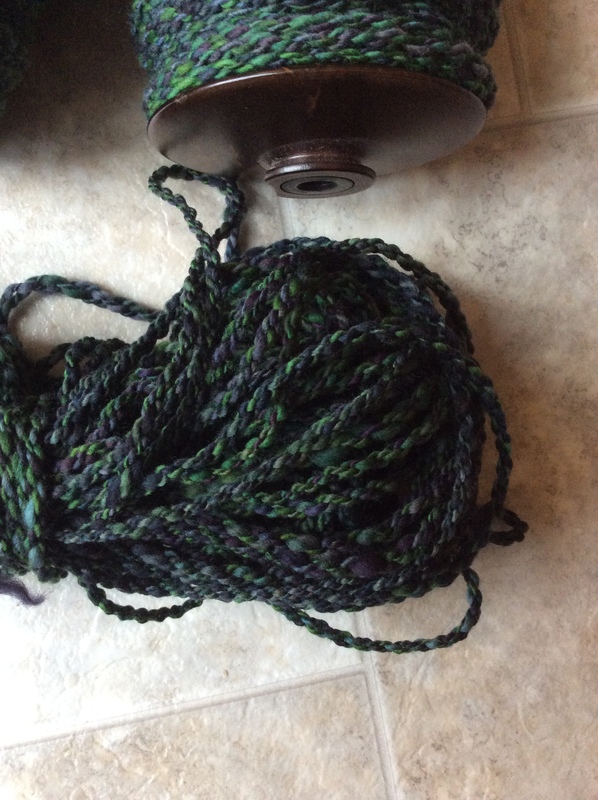 This one was going to be a two ply, but I decided I wanted to blend the colors more and have a bulkier yarn, so I sent each two ply through again adding lots of extra twist, and then plied the two together to end up with a four ply crepe yarn. I love the texture and look of the resulting yarn! 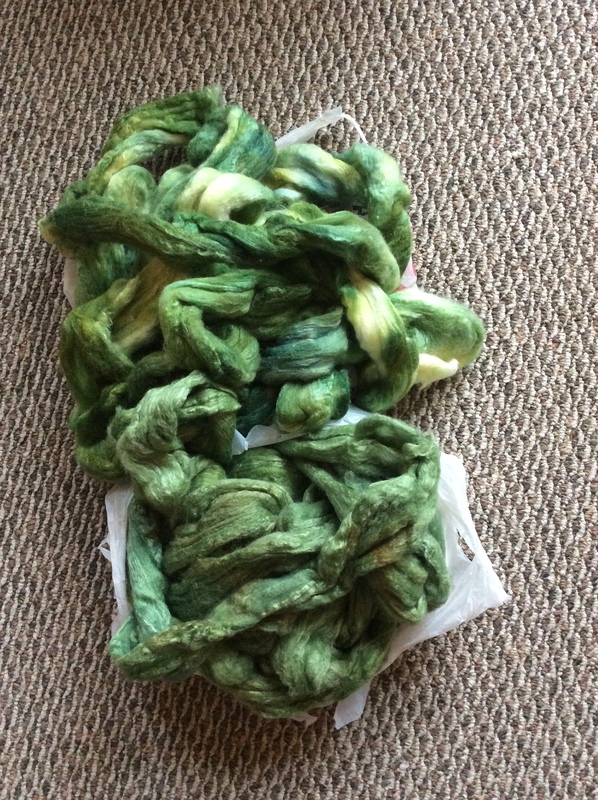 I started a new pile of green polwarth and silk yarn next, again trying for thicker singles. There are actually two different dye jobs in that pile, one with a lot more variation in shades, but the plan is to ply them together. Still sticking with the green theme of my recent yarn work, obviously. 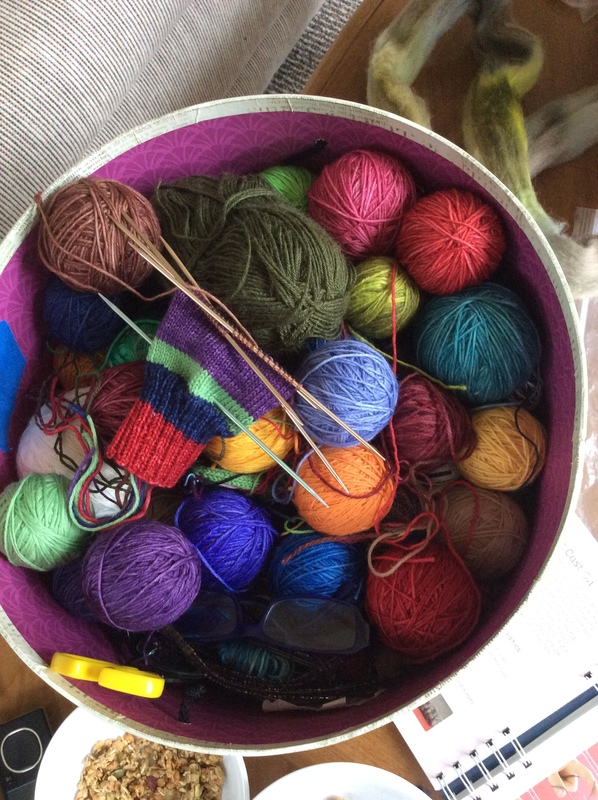 Paige’s yarn had a green tint as well, but a lot of other colors too. I really envy the huge bobbins on her wheel. 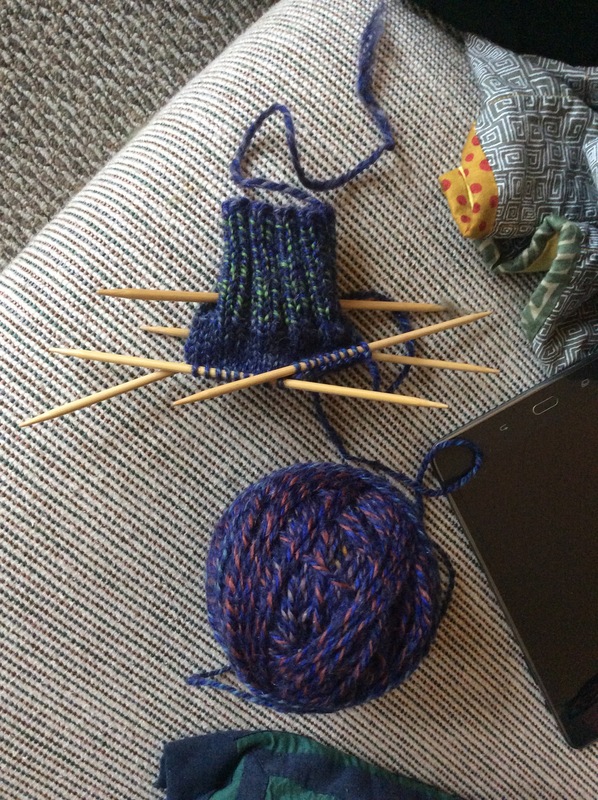 And I started a simple pair of garter stitch slippers with some leftover handspun, though I haven’t quite figured out how this rectangle is going to become a foot shaped slipper. I’m going on faith and following the row by row directions. 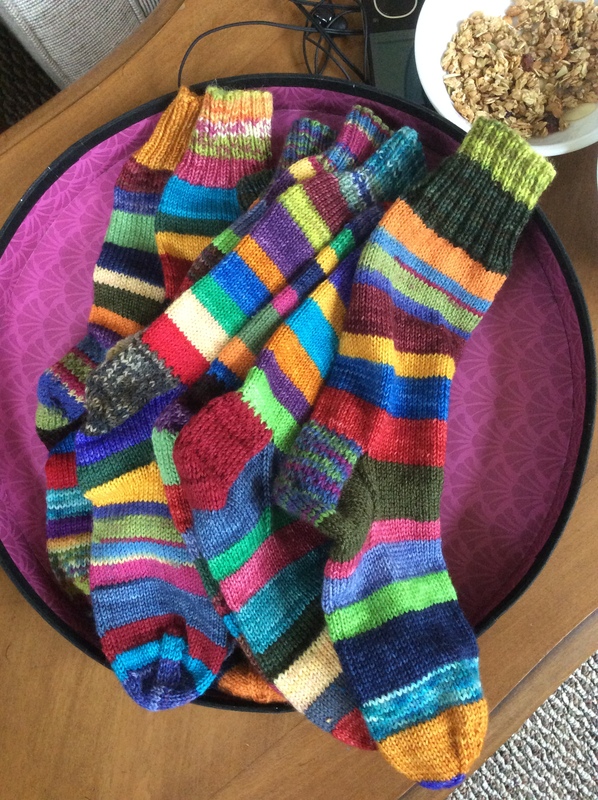 When not spinning or knitting socks, Paige also worked on fingerless mittens that she sells, along with the socks, at a holiday craft fair. There was also pizza, and catching up on family and friend news, and quilting talk, and a lot of needed sleep, and generally a really good time bookmarked (pun alert) by a weird but engrossing audio book that I listened to in the cars during the hours there and back. If you aren’t squeamish, I can highly recommend Stiff by Mary Roach, the history of cadavers. I’m back home now, in the storm of chaos we call bedtime, happy to be back with my family, but also really ready to get the next fiber retreat on the calendar.